On June 16, 2015, I had the honor of becoming the first DASNY President and CEO to be confirmed by the New York State Senate. My appointment is different than my predecessors as the Public Authorities Reform Act of 2009 now calls for Senate confirmation for this position. It was a wonderful day of meetings with a number of Senators, hearing their concerns and providing some with a better understanding of DASNY’s mission. It is truly an honor and a privilege that Governor Cuomo and the DASNY Board have entrusted me with the mission to find ways to offer low-cost financing to support financing and construction of the social infrastructure necessary to allow our public and private clients to serve communities across this great state. In my first weeks at DASNY, I have made it a priority to meet with as many staff members as possible. We are taking time to evaluate the entire organization. We are focused on finding ways to offer low-cost financing and construction solutions to support the vital social infrastructure necessary to build the future of New York State. Our clients are our most valued resource, and we are reaching out directly to them so that we know exactly what services they are looking for from DASNY. I am excited to step into the history and background of DASNY’s success. I look forward to working together with our valued clients, stakeholders and business partners. Together we will continue to stimulate our NYS communities, create jobs, embrace innovation and protect our environment by delivering quality projects and by financing and building smart, efficient and beautiful buildings for the NYS public for whom we serve. 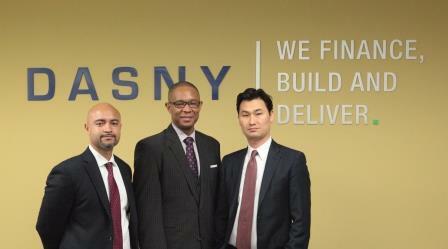 On May 7, DASNY welcomed Caprice Spann as DASNY’s Managing Director of the Office of Executive Initiatives (OEI). 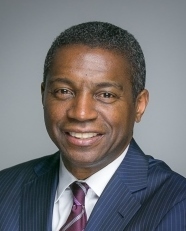 OEI is responsible for strategic efforts in program development, including maximizing the utilization of Minority and Women Owned Businesses (MWBEs), sustainability, training and marketing, as well as communicating with DASNY’s clients, vendors, the public and governmental officials. Much research and diligence went into the hiring process for this important management positon and I am confident we found the perfect fit with Caprice. She will maintain offices in both our Albany headquarters and New York City offices. Caprice joins DASNY having over 25 years of experience in the private sector, primarily with the global insurance company AIG. In her past employment, she distinguished herself in motivating various business units to exceed expectations, whether relating to sales performance, identifying and recouping overpayments to client accounts, or clearing $1 billion in property claims pertaining to Hurricane Katrina. Her management experience, background and creativity will be strong assets as DASNY’s OEI team continues to develop and implement new initiatives. DASNY tops the list of municipal bond issuers recently published by The Bond Buyer. Not only is DASNY tops in dollar volume, with approximately $4.7 billion issued, the Authority is also the most frequent issuer with 24 issues sold during the first half of 2015. Last month, the New York State Division of Budget announced the successful results of the sale of $1,170,800,000 in New York State Personal Income Tax Revenue Bonds. Investors once again demonstrated high confidence in the direction of New York. For the fifth consecutive year, New York passed a timely balanced budget that holds spending growth below two percent, reversing decades of dysfunction. The sales were conducted by DASNY (Dormitory Authority of the State of New York), in five tranches and were delivered on June 19, 2015. All bond proceeds will fund previously authorized capital projects, including the construction of SUNY educational and mental health facilities, environmental infrastructure projects, and EXCEL grants for school construction. “These bonds were sold on a competitive basis which resulted in aggressive bids with favorable rates for the State. Tranching the largest series was an effective way to encourage aggressive bidding,” said Gerrard P. Bushell, DASNY President & CEO. For the complete press release, read more. 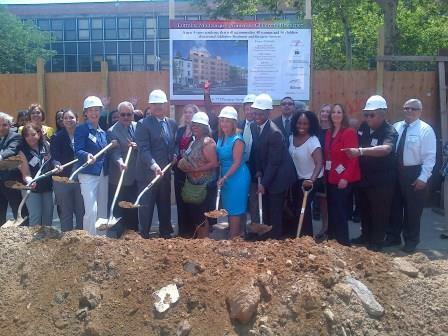 On June 30, DASNY’s new President had the opportunity to represent and speak on DASNY’s behalf at his first groundbreaking for the Lorraine Montenegro Women and Children's Residence. DASNY is providing design and construction services for this project pursuant to a Memorandum Of Understanding between DASNY and New York State Office of Alcoholism and Substance Abuse Services (OASAS). OASAS provided $12 million for the construction of the property at 773 Prospect Avenue. United Bronx Parents began planning the project in 2004. This will be a new 36,000+ square foot, 5-story full service residential facility, with 32 bedrooms that will accommodate up to 40 women and 56 children. This project reflects Governor Andrew Cuomo’s commitment to develop the social infrastructure necessary to provide safe housing and secure settings for essential community-based health care services. The building was designed to address the needs of the families, and creates a 'home' like environment for all the residents. The bedrooms are organized around central lounges and playrooms, with laundry, bathrooms and storage spaces. The building also includes a dining area, a library, art room, day care, and a greenhouse and play yard. Offices include a medical suite, administrative offices and counseling rooms. The design also meets NYSERDA’s New Construction requirements. Energy Star appliances and variable-refrigerant flow HVAC units will be used in the facility to maximize energy savings. United Bronx Parents (UBP) is licensed by the New York State Office of Alcoholism and Substance Abuse. UBP seeks to provide a safe and nurturing therapeutic environment for homeless women and their children to overcome substance abuse and the debilitating effects of addiction on their families. The program is unique in its commitment to keeping the family together. Mothers are allowed to reside with up to three children under the age of 10 in their own room. The children attend on-site licensed daycare, or school in the community. View from Stedman's Bluff on Goat Island looking over at Luna Island. In the distance, across the Niagara River is Niagara Falls, Canada. DASNY is overseeing the modernization of one of America’s national treasures. Work continues at the Niagara Falls State Park site for the NYS Office of Parks, Recreation and Historic Preservation (OPRHP) under the NY Works initiative and Greenway Funding. DASNY is coordinating construction management services on projects totaling $55 million. Nearing completion is work at Prospect Point and the final piece of the three-phase site-improvement project at the Lower Grove Sites is finishing up now. In addition, DASNY has overseen extensive renovations and improvements to the Luna Island Bridge and the North Shore Trail. The Administration and Visitor’s Center HVAC Upgrade project is also complete, and final commissioning is continuing. 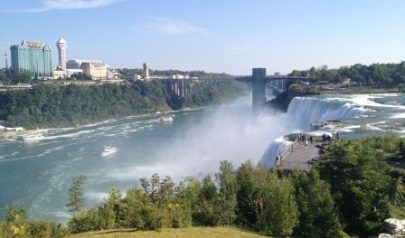 Sounds like a trip to the new Niagara Falls State Park should be on all of our vacation plans for this summer! Kudos to Michelle Paris, Rob Ryan and the Western NY team for a job well done. On April 27, 2015, CUNY’s Fiterman Hall and Advanced Science Research Center and City College’s Center for Discovery and Innovation received 2015 Excelsior Awards. The Excelsior Awards, created by the New York State American Institute of Architects (AIA), in partnership with the New York State contracting agencies, provide a model of excellence for future state-funded building design, professional practice and advocacy. Both projects are extremely unique and are a true testament to DASNY’s capabilities. During the 9/11 attacks, the former Fiterman Hall was severely damaged. The building had to be decontaminated, deconstructed and rebuilt from the ground up. The new building is an excellent example of New York State’s resilience and demonstrates that people working together can produce a quality project on schedule and under budget. CUNY’s Advanced Science Research Center (ASRC) and the City College of New York’s (CCNY) Center for Discovery and Innovation are DASNY’s largest projects to-date. The total 400,000 square foot, $705 million project offers two unparalleled core research facilities in a uniquely urban setting. D. Seaton and Associates, partnered with Squire Patton Boggs to serve as Bond Counsel on the $170 million deal for Barnard College (Morningside Heights, Manhattan). The College will use funds to finance the construction of a new multipurpose facility which will include a modern library, faculty and staff office space, classrooms and academic space, as well as the reconstruction and renovation of existing space. Managing Partner Douglas M. Seaton represented his firm on this transaction. Drohan Lee LLP teamed with Nixon Peabody LLP to serve as Bond Counsel on the $300 million deal for Columbia University. Columbia University intends to use bond proceeds to finance construction and renovation projects located throughout their University system and to refinance existing debt. 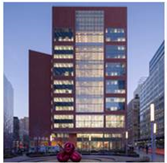 This team also served as Bond Counsel on the $350 million deal for State University of New York Dormitory Facilities. Bond proceeds from this transaction will be used to refund previously issued DASNY Lease Revenue Bonds. Partner, Jae W. Lee represented his firm on these two deals. 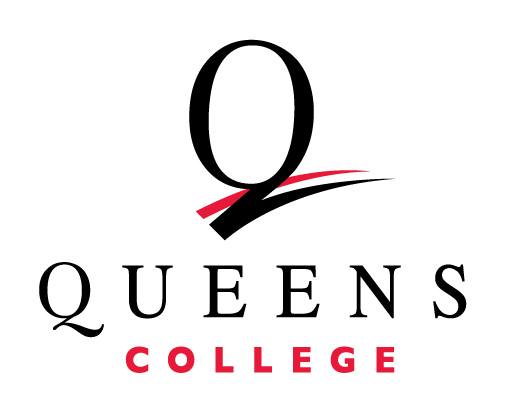 Kiely Hall at Queens College is a 230,000 square foot educational building used by 15 college departments including: administration, professional and continuing studies, adult collegiate education and the weekend college. The building’s mechanical systems and ancillary equipment and single-pane windows were in poor working condition as most of these items had not been updated in more than four decades. With DASNY’s oversight, the entire curtain wall façade on all four elevations of the 14-story tower were refurbished, which modernized the entire look of the building. Renovations entailed upgrades to the building envelope and HVAC systems, which included mechanical, electrical, and plumbing systems. The implementation of these improvements helps to provide substantial energy savings along with a reduction in the carbon footprint of the building. The $12 million renovation gave Kiely Hall a stunning new exterior and an interior with innovative and efficient new systems. Special thanks to DASNY Project Team Members: Duane Bowman, Architect, Jay Goldstein (Retiree), Chief Project Manager, Ron Mehilentze, Environmental Specialist, Phillip Picinic, Field Representative III, Anna Shoremas (Retiree), Administrative Assistant and Shawn Taylor, Project Manager for making the project such a success. At DASNY, we are committed to delivering excellent service to our clients, while providing innovative solutions. 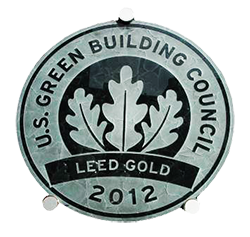 On January 1, 2008, DASNY established a green building policy titled All Green, Only Green, which states that all new, and significant renovation and addition construction projects will be registered for LEED status at a minimum level of Silver. Over the last seven years, our list of projects has grown to 37 LEED registered projects with 33 of those projects achieving LEED certified status. These projects range from small modular eight-bed health care facilities to large and technically complex science facilities, as well as residence halls. 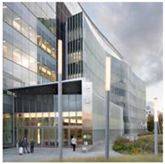 DASNY is also a leader in implementing innovative approaches in building operation efficiencies as evidenced by our LEED for Existing Building designation achieved at our downtown Albany headquarters. On Earth Day, DASNY recognized the 29 staff members with LEED Accredited Professional credentials who help make these LEED certifications possible. These employees bring their knowledge and unique skill set to each and every DASNY construction project. See who is Building Knowledge at DASNY.